This is the third of a special three-part series of investigations jointly run by chinadialogue and Yale Environment 360 with the support of the Pulitzer Center on Crisis Reporting. You can also read part one and two. Luo Jinzhi is 52, and lives in the village of Shuangqiao, in China’s Hunan province. For the last few years, Luo has been a petitioner, one of millions of Chinese people who find themselves appealing directly to higher authorities in the hope of resolving a problem. Some petition to rectify a legal injustice or to expose local corruption. Luo is petitioning on behalf of her fellow villagers for a remedy for the catastrophic pollution that has afflicted her home village. Petitioning is a demanding and difficult process in which success is not guaranteed: it involves a long and expensive journey to the nation’s capital, where petitioners are frequently sent on fruitless journeys from one unresponsive official to another. Luo Jinzhi made this thousand-mile journey most recently in April this year, to plead for action with the Bureau for Letters and Calls, the first stop for petitioners in the capital, and the Ministry for Environmental Protection, only to be told to go home and wait for the local government to take care of her complaints. She has yet to hear from any of them. For Mrs Luo and her neighbours, the first sign of a serious problem in Shuangqiao was on June 28, 2009, when Luo Bolin, a worker at the Xianghe Chemical Factory, died of cadmium poisoning. When he died his left leg was marked by large purple contusions; he was only 44. 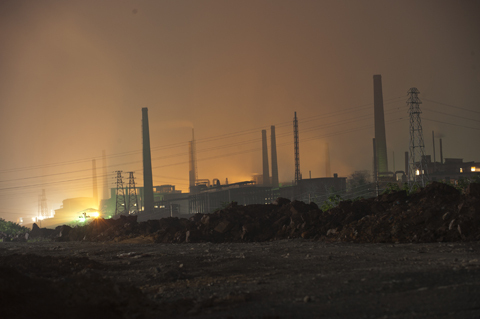 The list of cadmium-related deaths in Shuangqiao has since grown longer, and evidence is mounting of a national soil pollution crisis that threatens to overwhelm efforts to put it right. The Xianghe Chemical Factory, where Luo had worked, opened in 2004, on a site just 50 metres from the Liuyang River. The Liuyang flows directly into the Xiang River and is celebrated in Chinese Communist mythology as the symbol of an historic milestone in the Communist Party’s long struggle for power. It was here, in September 1927, that Mao Zedong led the first armed Communist revolt, the brief Autumn Harvest Uprising, and set up the short-lived Hunan Soviet, an episode that is still commemorated in songs in praise of the river. The factory employed 50 Shuangqiao villagers and produced an annual total of 3,000 tonnes of powdered and pellet zinc sulphate, an animal fodder additive. In 2006, apparently without government approval, it began to produce indium, a rare metal more valuable than gold, but the processing of which produces cadmium as a by-product. Starting in April 2008, the villagers of Shuangqiao began to notice small, but troubling changes: the local well water began to taste of rust, Mrs Luo recalls, and saucepans used to boil water changed colour. On June 27, 2009, the day before Luo Bolin’s death, the government of Liuyang municipality suddenly closed the factory and arranged health checks for more than 3,000 villagers who lived within 1.2 kilometres of the plant. Five hundred were found to have high levels of cadmium and a further four were to die during the government investigation. Shuangqiao became known nationwide as a 'cadmium village'. Luo Jinzhi has collected what she believes to be a still incomplete list of the names of the dead in Shuangqiao and the neighbouring villages of Dongkou and Puhua, starting with Luo Bolin. In all, she says she has identified 26 deaths from cadmium-related illnesses between 2009 and 2013. Although the government paid compensation of between 10,000 and 59,000 yuan (US$1,600 to US$9,000) to the victims’ families, it has never admitted a link with cadmium or other metals that have affected the villagers. In December 2008, for example, Luo Jinzhi's five-year-old nephew began to have breathing difficulties and became listless; he was found to be suffering from lead poisoning. By March 2009, 14 more cases in children had been identified. When the deaths began, the villagers started to protest: on July 29, 2009, hundreds of them went to the township government to complain that the factory’s cadmium pollution still threatened their lives. The next day, thousands of villagers surrounded the government building and Chen Run'er, the party secretary from the provincial capital, Changsha, had to be called in to address them. He promised the villagers that their complaints would be investigated, but on August 5, the Liuyang authorities ordered in hundreds of police with dogs to guard the township government. The confrontation ended when the head of the plant, Luo Xiangping, was arrested, the factory was permanently shut down, and the director and a deputy director of the Liuyang Environmental Protection Bureau were fired. Although the factory has now been closed, the pollution is still affecting the village. The nearly 10 acre site (60 mu) that the business occupied is surrounded by a two-metre (6 foot) wall. Behind it lies a large pile of toxic sludge. 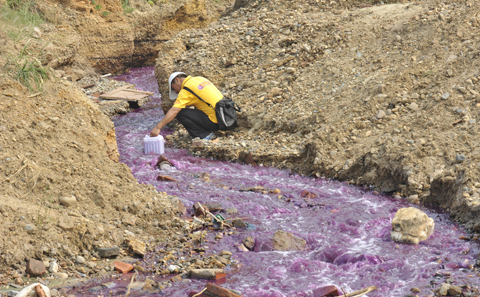 When it rains, contaminated water seeps from the sludge into the Liuyang River, just 50 metres away. Some 659 acres of land around the plant have been polluted with cadmium, and any crops grown there are contaminated. The villagers believe that moving offers their only guarantee of safety, and so they asked Luo Jinzhi to negotiate their relocation with the township government. Liu Bo is coordinator of the liaison office of the EU-Asia Environmental Support Chengde Project, a European Union-funded dialogue on urban river pollution, and investigated the factory site in January this year. He also concluded that “the pollution is continuing to do harm,” damaging the local land area and threatening the Liuyang River basin. The basin includes Changsha, as well as the Xiang River, the source of drinking water for 20 million people. Hunan province is an important centre for heavy metal production. In 2011 the province’s 1,003 non-ferrous metal companies produced 2.66 million tonnes of 10 different metals – the third highest production in China and worth 379.5 billion yuan, (US$60 billion). Several years ago the government said it hoped to turn Hunan’s Xiang River into the "Rhine of the East": beautiful, clean and prosperous. But in a report to an NGO conference in January this year, Chen Chao, an official with the Hunan Non-Ferrous Metals Management Bureau, admitted that the Xiang basin also had nearly 1,000 sludge sites or tailings stores which contained 440 million tonnes of solid waste that is contaminated with lead, mercury and cadmium. 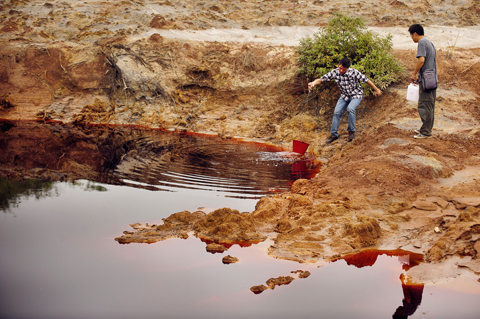 Chen Chao's report also revealed that Hunan accounts for 32.1% of China’s emissions of cadmium, 20.6% of arsenic, 58.7% of mercury and 24.6% of lead, in its wastewater, tailings and waste gases. The scale of this ecological disaster is daunting, and the potential cost of any clean-up would be formidable. According to a geochemical survey conducted by the Ministry of Land and Resources between 2002 and 2008, 2,058 square kilometres (794 square miles) in the area is polluted by heavy metals, an area that stretches from Zhuzhou, on the Xiang River, to Chengjingji. The survey report revealed that the area’s rice and vegetables, as well as reeds and mussels, all contained elevated levels of heavy metals, mostly of cadmium. Liu Shu is chair of the Shuguang Environmental Protection Organization, an NGO founded in 2013 in Changsha that works on soil pollution. This young environmentalist has investigated soil pollution in Zhuzhou, Changsha and Xiangtan, and confirms that the situation is extremely grave. Her group found cadmium levels 49.5 times the recommended limit in soil samples taken from the vicinity of a smelting plant in the municipality of Changning. At another site, an industrial park in Hengnan County, by the Xiang River, they found levels 331 times the limit. She is also concerned about the social conflict between local people and government that soil pollution has caused, conflict that she predicts will worsen if not resolved. In the case of the Xianghe factory, Liu and her team noted, the villagers are holding out for compensation and relocation. The township government has offered the Xianghe victims a share of the 8.5 million yuan (US$1.4 million) that they raised in an auction of the chemical company’s assets, but only on condition that the villagers seek no further compensation from the company or the government. With 659 acres of village land no longer fit to grow food, the villagers are struggling to make a living. When the government offered to pay them the market price for the 350 kilogrammes of rice that could have been grown on each 0.16 acres, some accepted the offer. For Luo Jinzhi and many other villagers, however, this is not a long-term solution. The share of the compensation for villagers who live close to the factory is only US$600, and it is US$250 for those living further away. It is not enough to finance a new life, and the villagers remain determined that the government should also relocate them. The government, meanwhile, has put its faith in remediation. Yonkers Environmental Protection company is one of China’s few listed soil remediation companies that is approved by the Ministry of Environmental Protection for remediation work. The company won the contract to clean up the Xianghe Chemical Factory site and, as early as August 2012, it announced that the site had been cleaned to standard. The villagers are sceptical, however. In September 2012, they sent a soil sample to Nanjing University’s Centre of Modern Analysis. Concentrations of 6.89 milligrams (mg) of cadmium per kilogram (kg) were found in a sample taken from the sludge pile, and 93.8mg per kg in a sample taken from a nearby field. According to China’s Soil Environment Quality Standards, cadmium levels in Liuyang should be no higher than 0.3mg per kg. One sample was found to breach that by a factor of 300. Although the government has not officially recognised these results, villagers question the effectiveness of the remediation. The 300-fold difference between the two samples, they say, is because Yonkers treated the land within the factory site, but not the surrounding land, where their polluted rice fields lie. Relations between the villagers, the government and the company are now so strained that remediation work has stalled. In January 2014, Liu Bo, the coordinator of the EU project, wrote to Xu Shousheng, the provincial party secretary, confirming the villagers’ complaints that “pollution has not been effectively controlled”. Liu found that soil at the site had not been solidified, while the limited range of techniques that Yonkers had applied had failed to address the range of pollutants – including cadmium, zinc and arsenic – on the site. He also recommended that remediation should include the surrounding fields and the entire river basin. Hunan is only one of many provinces in China that have suffered heavy-metal pollution. Incomplete figures from the Ministry of Environmental Protection (MEP) revealed that that in 2006, 150 million mu (24.7 million acres) of arable land was polluted, 8.3% of China’s total, but the government has been slow to understand the seriousness of the problem. It was not until February this year that the Ministry of Agriculture ordered a series of remediation trials that aim to give priority to safe management of farmland and to experiment with crop adjustment, as well as possible compensation mechanisms in cases where land or products have been badly contaminated. If the scale of China’s soil pollution is unprecedented, remediation must also be large-scale. Zhuang admitted, however, that as well as legislative and technological difficulties, funding for soil remediation was the largest challenge in a market that he predicted would eventually be worth 10 trillion yuan (US$1.6 trillion). A private industry body, the Jiangsu Institute of the Environmental Industry, has predicted that between 2014 and 2020 China’s soil remediation market could be worth 685.6 billion yuan (nearly US$110 billon). For now, however, finance is tight. In 2013 the Chinese government launched 42 soil-remediation trials, but only two involved funding of more than 100 million yuan (US$16 million). Funding for the 16 projects unveiled so far totals about 600 million yuan, (US$96 million), almost entirely from government subsidies. Chen Nengchang, a soil remediation expert with the Guangdong Institute of Eco-Environment and Soil Sciences, does not believe these numbers mean much, beyond that fact that money is being spent. China’s soil problem, he said, is not only one of pollution but also soil quality and soil erosion, and improving soil quality with increased organic matter and better pH levels is particularly urgent. On moderately polluted land, he argues, planting non-food crops would eventually clean the soil. Other experts, however, continue to grapple with the combination of the scale and severity of soil pollution. Liu Yangsheng, the secretary of the China Association of the Environmental Protection Industry’s Heavy Metals and Environmental Remediation Committee, has said that immature technology, lack of funding and unclear evaluation standards mean that restoration of heavy-metal polluted soil will be an ongoing struggle. The severity and extent of heavy-metal pollution in China, he said, mean that expensive techniques are unlikely to be widely applied, while techniques from overseas that may be effective for small plots of land are of limited use in China. Recent research findings offer some hope to China’s beleaguered soil. The Foshan Jinkuizi Plant Nutrition Company claims to have developed a soil-remediation technology specifically designed for China’s heavy-metal polluted soil: a microorganism that can change the ionic state of heavy metals in the soil, deactivating the pollutants so they do not harm crops. The company claims that the method is cheap, convenient, easy to use, does not produce any secondary pollution, and is already in commercial production and use. In another possible breakthrough, in April, the Guangdong Geoanalysis Research Center announced a new product, Mont-SH6, which they claim is a powerful absorber of toxic heavy metals such as cadmium, lead, mercury, copper and zinc. Liu Wenhua, chief engineer at the center, claims that the product can reduce soil cadmium levels by over 90%, and that materials and manufacturing costs are low: remediation of one mu (.06 hectares) of cadmium-contaminated rice fields with this technique costs about 30,000 Yuan (US$4,800). Mass production, claimed Liu Wenhua, could bring this down to between 2,000 and 3,000 yuan (US$320-US$480). These claims have yet to be tested. For now, the government faces more immediate decisions. Many property developers are hoping that polluted land will be re-classified as non-agricultural, so it can be earmarked for development. And, according to vice-minister for agriculture Niu Dun, business interests are pushing the government to classify even more land as polluted by heavy metals so that they can build on it. This is a clear battle of interests, says Niu, and the choice will be hard. Turning polluted farmland into commercial or residential land is a policy that carries its own risks. When houses are built on contaminated land, construction workers and residents can be exposed to health risks. In one notorious case from 2007, a construction site in Wuhan, the capital of Hebei province, a site that had previously been occupied by a pesticide factory was reclassified for residential development. The project was halted when a construction worker was hospitalised with chemical poisoning and the government was obliged to return the purchase price of the land, pay US$19 million in compensation to the developer and spend an additional US$44 million to clean up the site. As for how many other residential districts in China have been built on contaminated land, nobody knows.